Doni D. Beals passed away on April 15, 2019. Frank John Plotino passed away on April 16, 2019. Bardin, O’Neal – 95 years old, passed through the gates of heaven on Tuesday, April 16, 2019. Frances Crews Beatty, Age 77, passed away at her home in Ft. Pierce, FL on April 9th, 2019. William E. Jameson passed away on April 08, 2019. 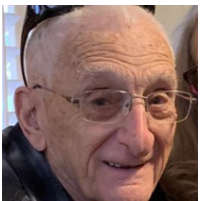 Leonard Weiner, 91, passed away peacefully under the tender loving care of Hospice of the Treasure Coast on Monday, April 8, 2019. Join us at Jupiter Community Park for a fun morning of hunting and bouncing and much more! Lawrence "Larry" Arthur Johnson, 66, of Port Saint Lucie, FL, died Thursday, April 4, 2019 at Tradition Medical Center in Port Saint Lucie, FL. Walter “Bud” Hamilton 91, of Port St. Lucie, Florida, passed peacefully on Tuesday, April 2, 2019.